It’s still far too early to sow most types of fruit and vegetable seeds. Unless you have a well-appointed propagator / greenhouse / cold-frame setup and the knowledge to move and manage your seedlings to safeguard them through the tricky, all-too changeable first part of the year, the results are usually disappointing. Thin, leggy seedlings, starved of light and desperately reaching up for any glimmer they can strive for: not the stuff that strong, healthy, productive plants are made of. Having said that, there are always a few exceptions to the general rule; a few plants that it’s good to get started early. Either species that need a long season of growth to develop to their full potential, or leafy mini-veg that you’re going to harvest before they’re anywhere near full-grown (think micro-greens, cress, that sort of thing) or, frankly, a few things that you’re only growing out of vague interest whose potential failure won’t constitute a disaster. Because, dammit, it’s good to get growing again! It’s good to feel like Spring isn’t so far off after all, and we’re doing something positive to bring a little new greenery into our lives. And as gardeners, we all need more of that sort of thing. So if there’s something you can get away with growing now, then get the hell on with it! 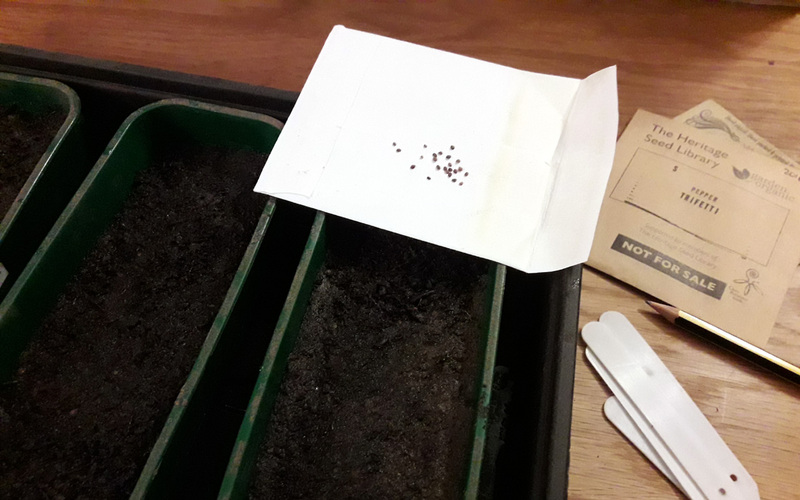 With all of the above in mind, and the fact that we do have a Vitopod heated propagator – complete now with recently-purchased grow-light rig – and a large, unheated greenhouse to provide plants with the required light and protection, I’ve sown a few seeds this morning. Capsicum annuum – Chilli pepper ‘Bolivian Rainbow’ and ‘Trifetti’ – Chillis need a good long season (and plenty of protection) to reach fruiting size in the north Manchester climate. Lycium ruthenicum – Goji berry ‘Black Pearl’ – old seed that I first sowed a couple of years ago. Might not even germinate, but it needs similar temperature to chillis, so I’ve sown it while the propagator is set to 24o. – Allium cepa (var. aggregatum?) – Potato onion ‘ Red Dakota’ – I’ve sown half now in propagator conditions and will sow the other half later in the year in a cool greenhouse, see how well either or both batches germinate. “Potato Onions”, by the by, are a multiplier onion, similar to shallots. In fact, they may well be shallots, just with a different name. Alex Taylor the Air-Pot Gardener very kindly sent me some seed last year, which I didn’t get around to sowing. Alex sourced the seed from the USA and grew his own onions from it, then I think he saved seed from those and that’s what I’m sowing. That reminds me: must check in with him and see how his grew last year and whether there’s any noticeable difference to the shallots we know and love over here in the UK. The developing theme for this week seems to be “emergence”. On a personal level, I’ve emerged from my Deep Dark Revision Cave, sitting four RHS Level 2 exam papers yeesterday, and am once again able to focus on things that don’t necessarily have a Latin binomial or a key role within a cohesive garden design scheme. For the time being, anyhow. 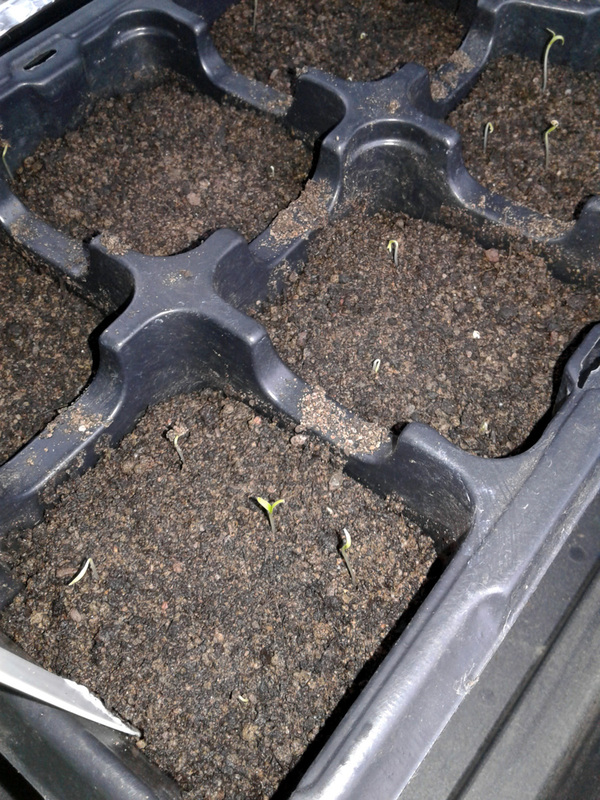 Meanwhile, on the growing front, the first seedlings of 2017 have emerged in the Vitopod propagator. First germination is always a lovely moment, one I look forward to immensely every year. 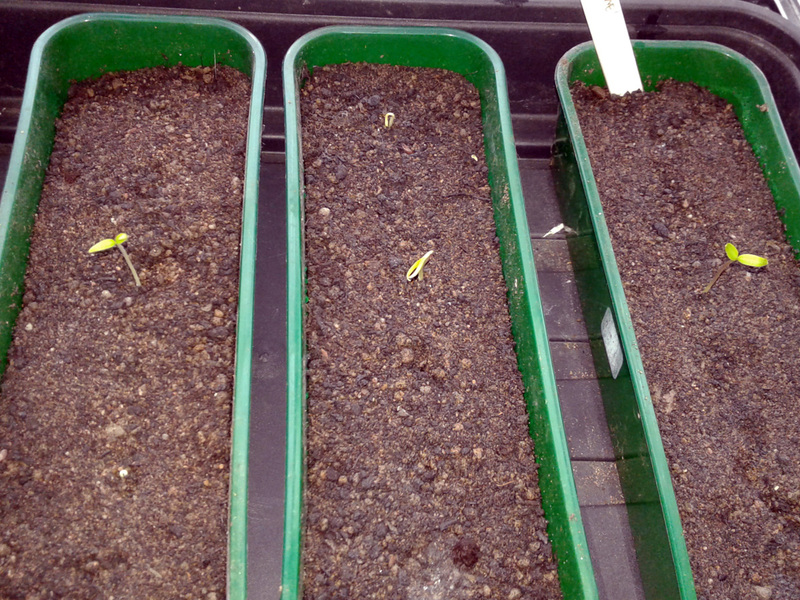 The first three chilli seedlings have poked their cotyledons above the surface and are starting to develop. They were all sown on January 20th. Note the ones that have germinated are all seeds sown in the middle part of the small trays. I’m assuming they’ve benefited from a lower rate of moisture loss and a higher constant temperature due to the volume of compost surrounding them. These tiny green shoots will hopefully grow on into two varieties of Goji Berry bushes. These specks of green are Goji Berry seedlings. I’ve sown far more than we’re likely to need for our own purposes so with any luck we’ll have spare plantlets to share around later in the season. They were sown on Jan 31st and emerged yesterday, so that means they germinated in just seven days. I’m going to leave the seed trays in the Vitopod for the time being, although I’m conscious that the humidity in there is probably too high to do so for too much longer, as it could result in poor growth and maybe even damping off disease. Once the majority of the seedlings have emerged I’ll transfer them to cooler, un-heated (therefore room temperature) trays with lids and let them grow on in peace until they’re robust enough to be pricked out into a more nutrient-rich compost. How are your seedlings coming along? Let me know in the comments, and please feel free to post links to your own blog as well.